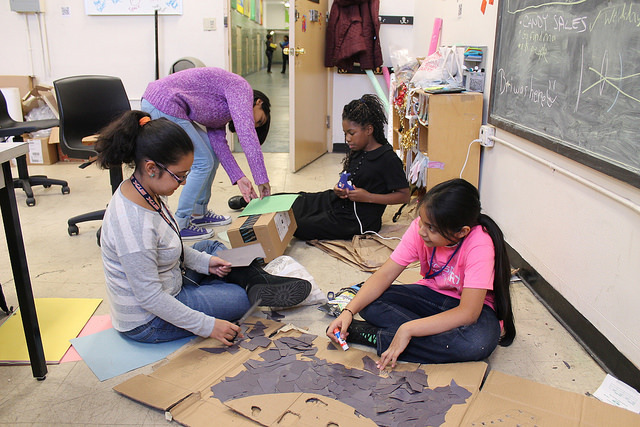 What happens when you give middle school girls access to circuits and coding programs? Robots that can play soccer. At Chapin, a Manhattan all girls school, four young ladies make up an after school robotics club. 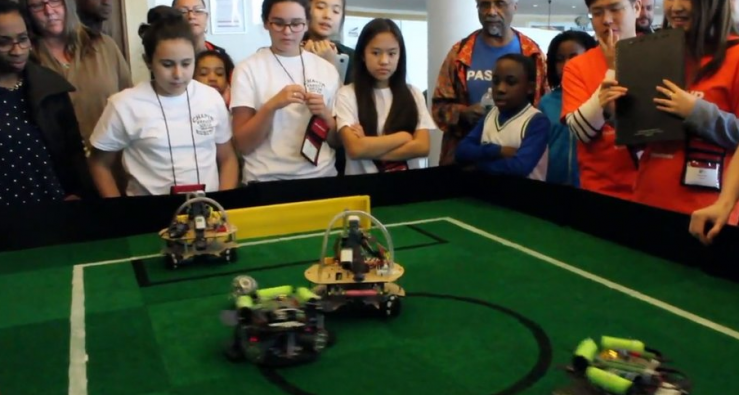 They decided almost last minute to participate in RoboCup Jr. USA, a qualifying competition for the international tournament by the same name. Over the course of the school year they learned to program, solder and build micro electronics. David Arnstein, club supervisor and science teacher at Chapin, explains this is a unique age for young women in science, especially at an all girls school. According to a 2015 National Science Foundation Study, high school girls are taking science courses at similar rates to boys. It is at the university level, where women’s participation begins to differ by field. Life science remains at 50 percent participation while engineering is at 19.2 percent and computer science at 18.2 percent. For now these girls cannot imagine losing interest. Team member Amelia dreams of being a neuroscientists while seventh grader Cindy and Tallula want to do something in either engineering or computer science. It’s now competition day. The Golden Gators put their robots “Christiano Robo-ldo” and “Tim How-bot” to the test at Horace Mann School in the Bronx. The Gators were the only all girls team in the soccer division. Amy Euguchi, the organizer of the event, said this year girls participated at nearly 50 percent, the highest since she started the competition 13 years ago. Euguchi believes new easy to use online robotics programs, has led to more participants overall including girls. Also increased media attention from news outlets like CNN and NY1 has increased interest. “People are talking about robotics competitions almost like a sports competitions which is exciting,” said Euguchi. At the end of the tournament many girls received trophies. The Gators were not among the winners, but that has yet to affect their love for science. The girls met post competition to brainstorm for the following year. Once a unanimous consensus was reached that they all will all be back for another season, hopes turned more positive. If they remain motivated, these young scientists may be the generation that changes the statistics. Great article! Shows that girls really can participate and do well in what has always been considered a “boys only’ club! Fabulous job, Megan!